Our extensive experience in the area of process equipment used in the Automobile industry also helps us to successfully match up with the requirements of Pneumatic Grease Pumps. These pumps are used for automatic feeding of oil/grease over ball bearings, motor pulley as well as other moving components of vehicles and use pneumatic power that is passed into different ports of in-built cylinders. Here, when Air is given to machine, Main Pump is operate for ejecting grease out from pump body. Here, we can make these available in different Drum Capacities. 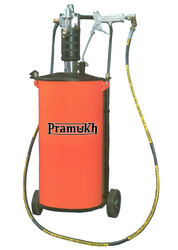 Looking for Pneumatic Grease Pump ?